Home » Jailbreak » Userland Jailbreak for iPad 2..? 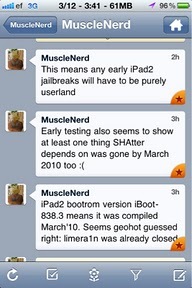 Userland Jailbreak for iPad 2..? 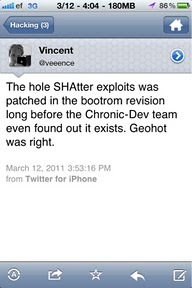 This is what MuscleNerd from Dev Team twittered today..
And Geohot was right about the SHAtter exploits hv been patched! But I think this will only affect the iPad 2 due to a hardware upgrade. However, the other iDevices will be able to Jailbreak. Let’s wait and see.